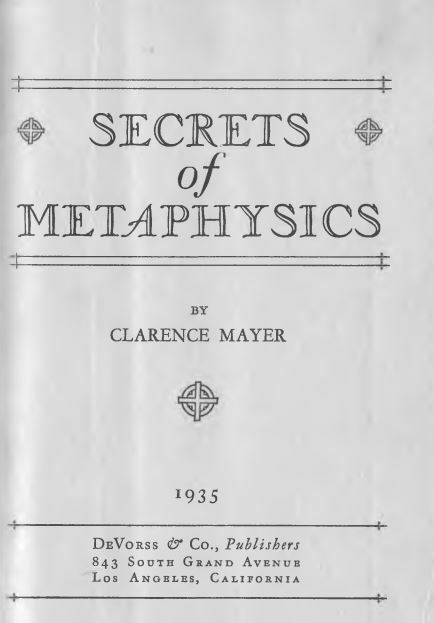 In the following pages entitled, Secrets of Metaphysics, Clarence Mayer has clearly laid bare the principle, application and process of spiritual mind healing. Consequently, one reading this book will find that the secret is revealed and the simplicity of a Universal Principle accessible alike to each and to all. The first edition of this book has found such popular favor, both at our Institute of Religious Science and in other places in the country, that I have strongly recommended this new and enlarge edition with a more permanent binding, so that students of the science everywhere may have it as a constant source of inspiration and information. I believe that all who read and study this volume will be greatly benefitted.